Billy Returns To Buffalo BIG Time!!!! 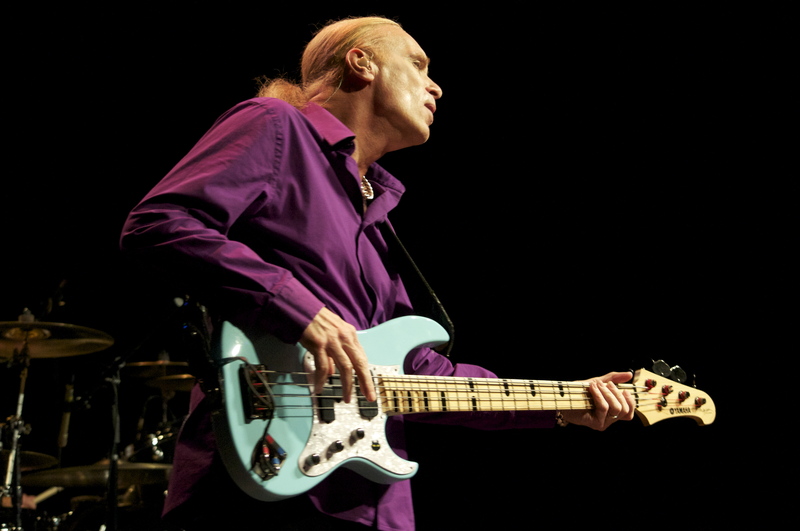 The Town Ballroom welcomed back native son Billy Sheehan along with his band Mr. Big Friday night. This show probably marked Billy’s biggest return to town since his 1986 visit. On that occasion he was in David Lee Roth’s solo band as they were touring in support of the classic “Eat Em’ An’ Smile” LP. Billy was also given the key to the city by the then-Mayor Jimmy Griffin on that September day. The original Mr. Big lineup reunited in early 2009 for the first time since guitarist Paul Gilbert had left the band in 1997. The band carried on with one-time Poison guitarist Ritchie Kotzen for a few years before calling it quits back in 2002. The band played for over two hours and made sure not to leave a bad taste in anyone’s mouth. Friday night was all about Mr. Big and the return of hometown bassist extraordinaire Billy Sheehan. It had been a few years since Billy had last played a show in the Buffalo area. As the band infiltrated the stage, they came out all guns blazing with “Daddy, Brother, Lover, Little Boy” the leadoff track off their biggest album Lean Into It. The band sounded real tight and were in full control as they tore into “Alive And Kickin’”. Up next came one of the highlights as the band revved it up for “Green Tinted Sixties Mind”, a guilty pleasure also from the aforementioned Lean Into It. Billy seemed like a kid on a playground as he looked like he was shot out of a cannon as he zipped about on stage. His enthusiasm as well as his spot on bass playing really made the show a treat to watch. Mr. Big played no less than six songs from the recently released What If CD. “Just Take My Heart”, a song that made the top 20 was very well received by the crowd. From there the band played a cluster of songs that most in the near capacity crowd seemed not to be familiar with. After what seemed like a limitless guitar solo by Paul Gilbert, the band seemed to kick it into overdrive for a few songs until it was Billy time. Finally the time had come as Billy got his turn alone on stage. He put on a clinic during his bass solo and that was quite the understatement. As the show began to wind down, the band closed out their main set with “Addicted To That Rush”, the first song that ever received them airplay from the debut album. For the encore, you just knew “To Be With You”, their lone #1 hit would be in there somewhere. As the crowd sang along, one quite noticeable thing was how happy the band seemed. Smiles and high fives were exchanged throughout the show. The band appears to be really enjoying themselves despite of all the negative things that happened in the past. Things really got crazy following “Colorado Bulldog” as all four members swapped out spots for a rendition of Deep Purple’s “Smoke On The Water”. Billy actually sang the first half before the band swapped again and drummer Pat Torpey finished it up. Dave Constantino, a former member of Billy’s old band Talas had opened the show. This led to speculation that perhaps the two of them would jam on a tune. Sadly it never came to fruition, although Mr. Big did treat the crowd to the old Talas standard “Shyboy” to close the show. Mr. Big then pulled off one of the classiest moves by a band in recent memory. Billy was the last one left onstage and as he addressed the audience, he said Buffalo would always be with him wherever he goes drawing a great response as he left the stage and faded into the night. ON the down side- NO Wild World which was a top 40 hit. No get together of Dave Constantino/Billy for a jam or song at all. Special Thanks to Sammy Mazur and Joe Wright for helping us cover the show!